Our LA IV Plus aerator is a high-speed, coring, roll-type unit built for the rental industry as well as commercial users with smaller aeration jobs and is now even more rugged and versatile than before. A fold-down handle and protected lift grabs allow for safer, easier transportation. New ergonomic features including a more comfortable handle, a handle-mounted throttle and rubber grips make it much easier to operate. For increased reliability, the solid steel axle is mounted on construction grade ball bearings and is driven by a single O-ring sealed chain. Easy-attach dual weights give excellent results in harder soils by increasing ground pressure by more than 25 percent, as well as balancing the unit on uneven terrain. With water drum filled, tines will penetrate down to 2.75 inches. For speed, versatility and value in a core aerator, nothing pulls more profits. 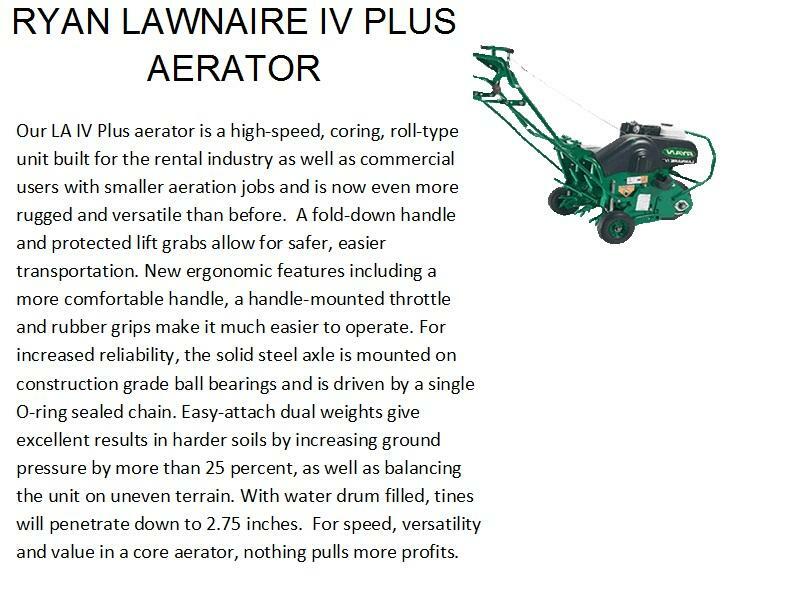 The Lawnaire® V aerator offers the same convenient features and durability as the Lawnaire IV aerator. 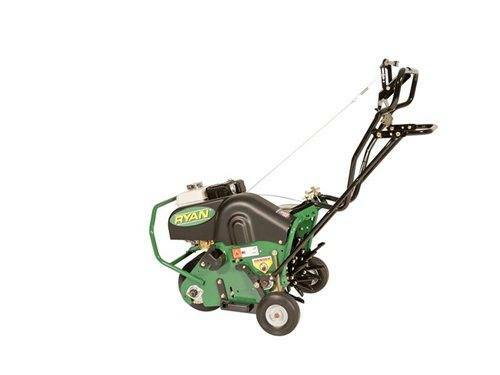 But when you need to aerate a larger area faster, there's no better choice than this coring, drum-type aerator. With a 26.5-inch swath and quick ground speeds, you can cover up to 40,000 square feet in an hour. Covered lift grips and a front bumper guard make tying down for transportation easy, as well as add protection from damage. Removable rear wheels simplify maneuvering in tight areas and let you pass through gates and down narrow paths with ease. 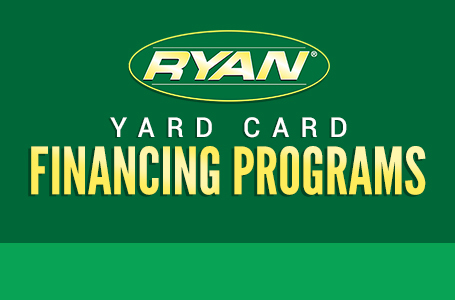 For rental houses that want to offer their customers the foremost lawn equipment, and for lawn care contractors who know that time means money, the Lawnaire V aerator simply can't be beat. Fold-Down Handle - Allows the machine to takeup less space in transportation vehicles adn rental houses. Available on LAIV model only. Handle-Mounted Throttle - Handle-mounted design for operator convenience. Productivity - Produce more holes in a single pass. LAIV: 19” swath you can cover up to 29,000 square feet in an hour. LAV: 26.5” swath you can cover up to 40,000 square feet in an hour. Removable Rear Wheels - Make it easy to maneuver in tight areas and though gates for increased productivity and flexibility. Available on LAV model only. Removable Weights - Weights are easily and conveniently removable for less weight when loading and unloading. Rugged, Heavy-Duty Construction - Specially designed for day-to-day use and the rental industry. Self-Propelled - Makes loading and unloading easy; ideal for rental houses. Tines - ¾” hollow, tapered and austemper-hardened steel tines to pull cores in difficult soil conditions. LAIV: 30 tines per aerator. LAV: 42 tines per aerator. Warranty - 2 year limited warranty.